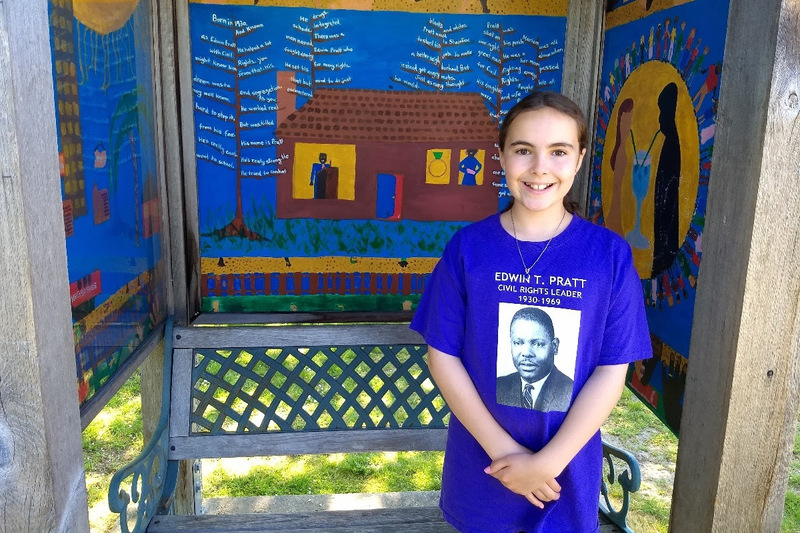 A CBS news crew came to Shoreline over Memorial Day to interview 10 year old Sarah Haycox about her efforts to honor slain civil rights leader and Shoreline resident Edwin T. Pratt. 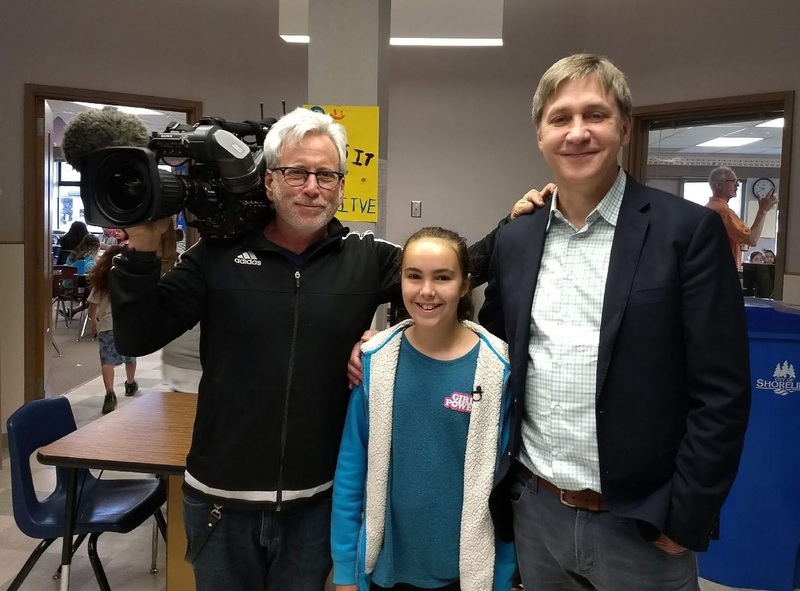 The 'On The Road With Steve Hartman' segment is scheduled to air on the CBS Friday Evening News with Jeff Glor on June 15th (airs on KIRO at 6:30pm) and on the CBS News Sunday Morning with Jane Pauley on June 17th (7-8:30 am). Sarah was interviewed / filmed at various Shoreline locations including the Shoreline Historical Museum, Shoreline Park, and her 4th grade classroom at Meridian Park Elementary School. Learn more about Sarah's continued efforts at her GoFundMe page. Assist Edwin Pratt’s family with travel/housing costs to attend the dedication of the new school building in 2019. Contribute toward the commissioning of an artist of color to create a memorial for the new building so that future generations will know of this local hero. Continue her efforts to educate others about the life and death of Edwin Pratt and to inspire other young people to speak up and speak out for social justice causes. This story should be titled "How a 10 yr old girl restored this 48yr olds faith in humanity." For the influences in her life thus far, I commend you. I cannot wait to see Mr Pratts wonderful family at the new buildings dedication. Sarah, my wish for you is that you continue to always be the light that you are. Yes, I fully agree that Sarah has given me much hope in today's environment of hostility and division. But what I wonder about, when I read the Go Fund Page, is why in world did it take Sarah such energies to get this approved through our school district? Should have been a no brainer I think. Just saw coverage of Sarah's efforts! Wow, really impressed! We need more people with Sarah's heart and conscience! 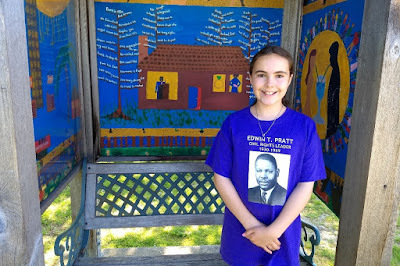 History statement on web site Pratt Fine Arts Center serves as a lasting tribute to Edwin T. Pratt, a man who relentlessly championed open and equal access to educational and housing opportunities for all of Seattle’s residents. Pratt Fine Arts Center honors his memory by continuing to pursue its mission of making art education accessible to everyone, for people of all ages, all skill levels, and all backgrounds. Operating as a nonprofit 501(c)3 organization since 1976, Pratt has had a huge impact on the creative health of our community and launched the careers of many established local, regional, and nationally known artists. What began as a small arts center with big dreams has grown to become a beloved resource for thousands of students and hundreds working artists annually. I agree with Ana T., and further suggest they contact Pratt Fine Arts Center for assistance in creating the memorial for the new learning center in Shoreline being named in his honor. OUTSTANDING!!!! Reading this from Palestine and being the father of two daughters, I have my hat off to Sarah Haycox. Well done!